I love the music of Junoon, but Salman Ahmad’s politics are completely baffling to me. As the captain of the Pakistan cricket team, I had a good relationship with Zia. He used to call me personally when we won matches and when, in 1987, he asked me on live television to come back out of retirement for the sake of the country, I agreed. In 1988, while I was playing for Sussex and living in London, I got an unusual call from Pakistan. It was my friend Ashraf Nawabi, who was close to Zia. He asked if I would become a minister in the General’s cabinet…Nawabi’s offer took me completely by surprise. I declined it politely, saying that I was not qualified for the job. A day later, Dr Anwar ul-Haq, Zia’s younger son, called me up and urged me to join the government for the sake of the country. I had already retired following the 1987 World Cup but a year later General Zia requested my return to the sport on national television. At a dinner organized for the team he took me into another room and warned me about what he was going to do. “Don’t humiliate me by saying no”, he said. “I am going to ask you to come back for the sake of your country”. Touched by the appeal to my sense of patriotism, I of course had to say yes. In the summer of 1993, I was asked to be a cabinet minister in the caretaker government of Moeen Qureshi that had been formed following the dismissal of Nawaz Sharif’s government by President Ghulam Ishaq Khan. Qureshi himself called me. Again, I declined. However, by now I was thinking about how I could make some kind of political contribution. During this period I also started meeting a lot of politically minded people and held endless discussions on the state of the nation. I had been hoping that certain people I knew would form a political party I could support, but in the end they had neither the financial resources nor the nationwide support to challenge the two established parties, the PPP and the PML. So that option was not available to me. I had also explored the possibility of supporting one of the religious parties. 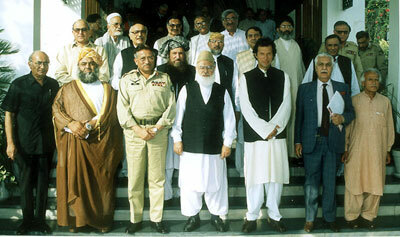 After Musharraf had come to power in a military coup in 1999, many of us in Pakistan hoped he might bring a new lease of life to our country, following years of unstable and corrupt civilian governments…Yet even at my first encounter with him, in a secret meeting a few months after the coup, the alarm bells should have rung. General Ehtisham Zamir headed the political wing of the Inter-Services Intelligence (ISI) agency, and was tasked with bringing together General Musharraf’s ‘coalition of reform’. He was looking for my party’s support for the General, to give him ‘the strength to take on the crooked politicians’. After the referendum, in Spring 2002, designed to give legitimacy to Musharraf’s presidency, we met again and he told me of the ‘Grand National Alliance’, and that’s when the alarm bells started ringing. I met Musharraf for the fifth and final time on 23 July 2002, when he invited me to President House in Islamabad; I was hoping to change his mind about making this coalition of crooks. It was then I realized how much those of us who supported him initially had been fooled by his promises to clean up the political system. Also present were Musharraf’s spokesman and national security adviser, along with the head of the ISI, and Zamir. But now we were firmly out of the establishment-backed coalition. Consequently, a lot of potentially good candidates abandoned us. The ones that were left were turned on by the ISI. How could the ISI ‘turn on’ PTI officials unless they were with them in the first place? Whether intelligence agencies ‘turned on’ PTI in 2002, Imran Khan certainly seems to be back in their good graces now. In 2011, Prince Jam Qaim told A. K. Chishti that “some well wishers in the military had advised me to join Imran Khan”, and in May of this year, former chief of General staff and Director General Military intelligence Lt Gen (R) Ali Kuli Khan Khattak joined PTI. While this does not mean that PTI is a being backed by ISI or the military, it is still interesting to think why Imran Khan is so popular among military and intelligence officers, particularly those from the eras of past dictatorships. It is also worth noting that, despite Imran Khan’s criticism of past dictators in his book, his criticism is always about how they turned out to be disappointing dictators – not that he had a problem with them being dictators in the first place. In fact, it seems like Imran Khan never met a dictator that he didn’t originally support and even have secret meetings with. None of this suggests that Salman Ahmad should or should not support Imran Khan, Nawaz Sharif, or any other politician. But, please, let’s not be selective in our memory of who was and who wasn’t given a place in politics by dictators. Imran Khan is many things, but he’s no angel. This entry was posted in Blogs and tagged dictatorship, imran khan, Junoon, musharraf, PTI, Salman Ahmad, Zia-ul-Haq by Mahmood Adeel. Bookmark the permalink. If I use the word creation in context to this text it would be blasphemy for then I would challange the Omnipotent Creator! But I could say inventor for General Zia ul Haq who first invented ISLAM followed by NS then the mother of TERRORISM and now we know about IK.He must be related closely to Da Vinci! Last Thursday in the dark of the night I was watching a bout in the ring between NS and IK and surprisingly the rest of the Warriors sitting outside the ring either cheering or hooting.I began to search for one particular warrior whom I saw sitting sullen with his packed baggage.I wanted to crossover and find out what was happening when I was awoken by my siamese cat wanting his breakfast. What does it prove?Nothing at all just how much you hate him.Being the Captain of the cricket team and president the patron,there,must be some contacts between the two at that time.Imran has himself regretted his endorsement of President Musharaf, at the time Sharifs were going in the wrong direction,trying to make himself” Ameer-ul-Momaneen”.What a joke the two brothers and their party are.How those contacts between him and Zia,makes him his creation?While the real creation of Zia are Sharifs themselves,which you are ignoring all togather.What a shame on you. He is a new breed of politician, coming from outside the feudal and industrial elites and attracting the urban middle class, but analysts say that despite headline-grabbing rallies such as the weekend event he has little chance of becoming prime minister in elections due next year. IK is a great person and a visionary leader, it least he has the power to say TRUTH not like these two brother NS & SS.